Why would footprints in sand appear raised? I recently took this photograph of my foot prints in the sand and it was only after I noted that the "footprints" are not IN the sand they appear to be "raised" on the sand? How could this be? Rob - The questioner has sent in a wonderful photograph of footprints on a sandy beach. 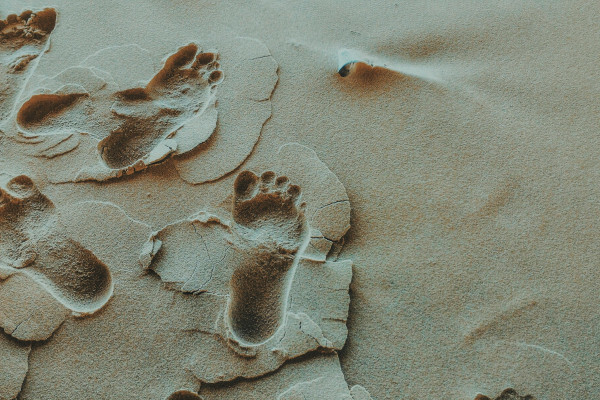 What's striking about the photograph is that the footprints seems to rise up from the surface of the sand rather than sinking in. In fact, the footprints are normal footprints. They're sunk in as you would expect. Their raised appearance is an illusion caused by the pattern of shadows. These shadows are ambiguous. They could result either from bumps lit from the top of the picture plane, or from indentations lit from the bottom of the picture plane. In the face of this ambiguity, the brain makes its best guess as to which is more likely and that is what we see. With this particular image, our brains make the wrong call. Why? Because they have a built-in bias to assume that light comes from above. This is a sensible rule of thumb because sunlight generally does come from above, but not in this photograph. Here, the sun is setting behind the photographer, below the bottom of the picture plane. This is evident from clumps of sand in the foreground that act as mini sundials. Under these lighting conditions, only indented footprints could create the pattern of shadows we see. So the footprints must be indentations after all. Diana - So the problem is that our brains have a bias toward top down illumination which means that the brain tends to assume light is coming from above. This bias is so strong that it often competes and overcomes the clues our vision is giving us about relative depths. So when light comes from a slightly different angle, in the case of the footprints in low sun, our brain tries to tell us they're convex instead of concave. Previous How can one cable carry many signals? Next Can types of pain be related to specific organs or diseases? While walking in beach , our footprints are made in sand. What is the reason behind it ?